Tom McCutcheon owns and operates a training business that is located in Aubrey, Texas and has created a business with an international base. His fluent Italian, plus contacts he made during a stint in Europe early in his career, give him a decided advantage in the worldwide equine market. He was already positioned in a leadership role in that global industry when the recent acceptance of reining by the Federation Equestrian International cleared the way to its becoming an Olympic event. Born into the performance horse business in western Wisconsin, Tom joins his father and three brothers as a professional horse trainer. He is the owner of Tom McCutcheon Consulting Services, a worldwide consulting firm for the reining industry. Tom has long been involved in building up the reining industry behind the scenes, and is a co-founder and Chairman of the Board of Directors of the National Reining Breeders Classic, the largest added money reining event and stallion incentive program in history. Additionally, he is a member of the USEF Board of Directors, and a member of the NRHA Professionals Committee and is a member of the National Reining Horse Associations Professional Riders Committee. As a trainer, Tom is one of the reining industry's leading riders, with numerous championships to his credit and lifetime earnings exceeding $1 Million! His wins include an NRBC Open Championship, two National Reining Horse Association Derby Reserve Championships, the Tradition Open Futurity, the SWRHA Open Futurity, the and he is a many-time finalist at every major NRHA event. On the international stage, Tom has won the USET Reining Championships and was a member of the 2003 USA Reining Team, which won the Team Gold Medal at the World Equestrian Games in Spain in 2003. 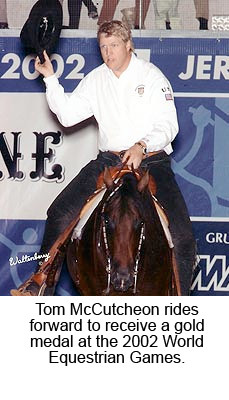 In 2010, Tom again earned the prestigious honor to represent the US, and he will be riding Gunners Special Nite, owned by Turnabout Farm, at the 2010 World Equestrian Games in Kentucky. The facility at Tom McCutcheon Reining Horses is second to none, with full training, breeding, and rehabilitation amenities. He is joined by a very talented team of assistant trainers, and together the team regularly wins top honors in Open and Non Pro competition. An avid sports enthusiast, basketball and hockey feed McCutcheon's need to compete when not in the show pen. Tom, his wife, Mandy, and their son Cade and daughter Carlee, live in Aubrey, Texas. Mandy is also one of the industry's leading riders, and is the only woman and non pro to surpass $1 Million in earnings. 2011 FEI World Reining Finals Champion & 2010 World Equestrian Games Reining Individual & Team Gold medalist, Tom McCutcheon gives Bernie his first lesson on a reining horse.